Speech and Occupational Therapist Dacula, Buford GA | Language Therapy | TSG, Inc. Please feel free to use our Referral Worksheet as a guide. Once this information is received, we will make a determination if a new evaluation will be required before therapy can begin. Most children are seen for an evaluation on their first visit. The therapist will take a few minutes to discuss your areas of concern before beginning the assessment and will ask you additional questions regarding your child's development, medical history, and skills seen at home as the test progresses. In addition, you will be given information on the type of evaluation instrument that will be used to assess your child. Testing typically takes between 60 and 90 minutes to complete. Your child may be asked to point to pictures, answer questions, eat different foods, or play with the clinician depending on the age of the child and the areas of concern. Parents are asked whether they would like to accompany their child for the evaluation or whether they would prefer to remain in the waiting room. It is important to put children in an optimum environment to demonstrate their abilities. If siblings/small children are present, we request that the caregiver remain in the waiting room with the additional children to allow the patient to devote his/her full concentration to the evaluation. If you join your child for the evaluation, it is important not to "help your child" by rewording the testing questions as this can make the test invalid. After the testing is complete, the clinician will give you some preliminary results. If additional scoring time is needed, the clinician may call you later with the final results/recommendations. The therapist will let you know whether your child qualifies for therapy and how frequently therapy is recommended. In addition, the therapist will provide you with ideas/strategies you can use at home to help your child. A written evaluation report will be mailed to you or given during your first session. After frequency recommendations are made, an office staff member will contact you to discuss scheduling. If your child has been recently evaluated and a new evaluation is not deemed necessary, your child can be scheduled for therapy. 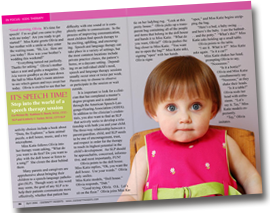 To "experience" a typical therapy session please read "It's Speech Time!," an article co-written by Therapy Solutions own Katie Burch, M.Ed., CCC-SLP and published in Gwinnett Parents magazine. If you need a Suwanee speech therapist or any type of special need therapy in Gwinnett County, contact TSG, Inc. today. © Copyright 2019 Therapy Solutions of Georgia, Inc. All Rights Reserved.